As some of you may know, I have dabbled in magic throughout the course of my life. I consider food and magic to have a few similarities that really speak to me. For one, you can tell a story with them both of time, place, history, adventure, and so on. Also, you can transform simple, unassuming ingredients into stunning, inexplicable, and flavorful magic. The mango embodies this idea for me in a poetic way. The mango doesn’t look like much, it harbors a fearsome nemesis, but contains some of the most versatile fruit flesh around. Think about it, you can use it for salads, soups, marinades, smoothies, and breakfast to name a few applications. One of my favorite uses of mango is to make mango salsa. To me, this salsa, is magic with mango, red onion, jalapeno, cilantro, salt, pepper, and a little lime juice. All pretty standard ingredients, right? Yes, without a doubt, but it is the gift that keeps on giving. It is sweet, spicy, fresh, and bright with the lime and the bit of tartness of the mango. Enough talk, how about a picture? Making this salsa is simple just dice up a couple of tablespoons red onion, cilantro, jalapeno (start with less as you can always add more), a couple of teaspoons of lime juice, a pinch of salt and pepper, and boom, you are done. The only real challenge here is unlocking the mango from it’s skin and the pit. Oh, this is the nemesis I was referring to earlier. The pit is oddly shaped and takes up a lot of space. Hopefully some of the information below you will find useful. First, most importantly, get a sharp knife so you can handle this easily. Next, stand the mango up with the tapered end towards you. 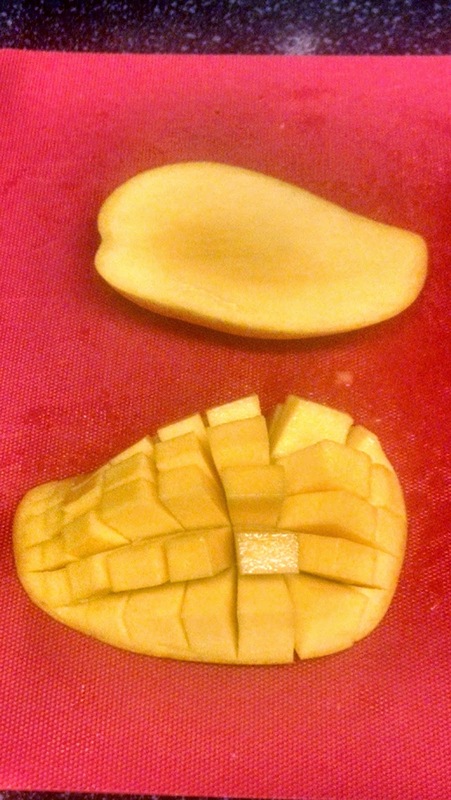 Take your knife and make an incision about a quarter of an inch from the outside edge of the mango. Letting the knife do the work (and it will with most ripe mangoes), cut all the way until you have one piece of it off the side of the pit. If you encounter resistance, don’t force the knife down. This is your sign that you are likely trying to cut into the pit, which sits just under the edge of the flesh. Slide your knife over a little bit to one side or the other from where you working. You should end up with something that looks like the top half of the photo. The easiest way to remove the fruit is to make a tic tac pattern through the flesh and then turn it inside out and you will get the bottom part of the photo. Be careful, as a sharp knife will easily punch through the skin of the fruit and could leave your hand a little worse for the wear. Finally, holding the flesh of the mango with your fingertips, and pushing down, start to work the knife back and forth between the skin and flesh until your little squares of mango begin to come free. 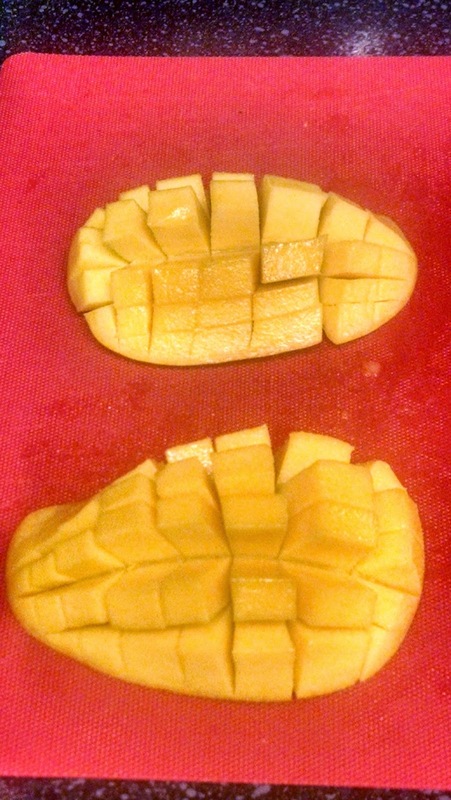 Don’t worry, if you end up with pieces of mango that still have flesh on them, just trim them with a knife. There you have it. 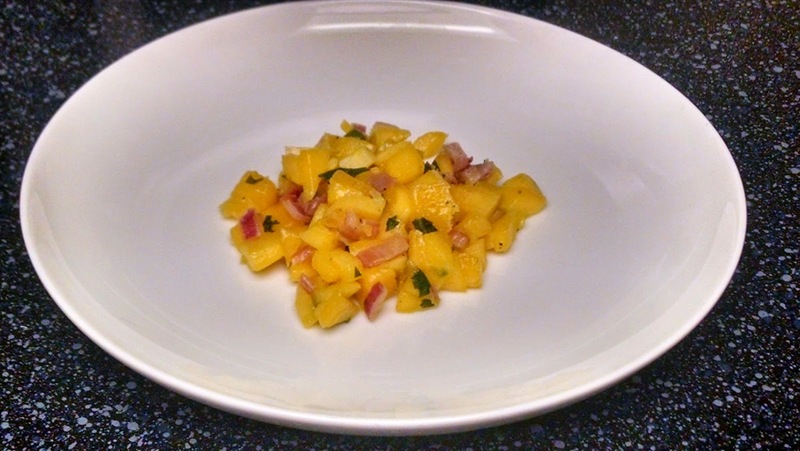 Simple, flavorful, and magical mango salsa. Make sure to taste and check your seasoning, as sometimes the mango can be a little sweeter or a little more tart depending on how ripe it is.